Today through Sat. is the Original Sew & Quilt Expo at the Dulles Expo Center just west of Washington, DC. I'm working at two booths: Early Times Workshop and Apple Mountain Quilts (www.applemountainquilts.com). Both vendors are selling my patterns. If you live in the area, come for a treat of sewing and quilting vendors. I'm Deborah Schupp, a quilt designer with a bit of a twist. I did not grow up playing under my grandmother's quilt frame - she didn't have one. The weather was warm to hot 10 months of the year, so no one had quilts. I had one thin winter coat and complained when the temps got to 60 degrees. 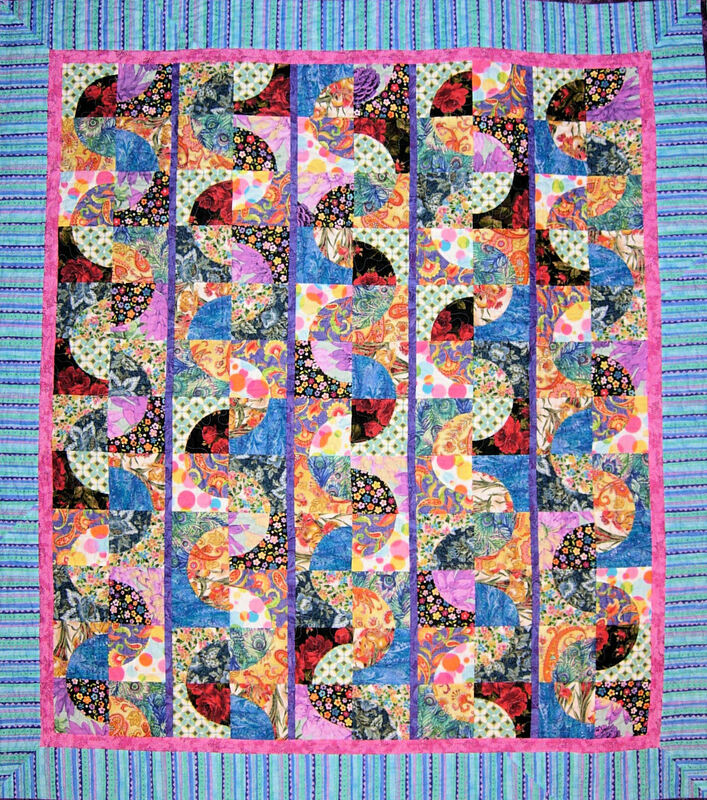 So marriage and moving to another state, where there really were four seasons to the calendar, changed my life - I was introduced to quilting, big time! The big benefit to not growing up quilting is I didn't learn the rules - not a one! Which has made my growth in designing a much easier journey. I learned to sew at an early age and have always enjoyed a variety of handwork, so quilting was a natural transition. My patterns are influenced by the rich culture and heritage of south Louisiana. You guessed it, I'm from New Orleans. NOLA will always be home no matter where I live. I just carry as much with me as possible: food, music, art, pagentry and a love for color. As you will see on my web site Gumbo Design Studios there's not a beige quilt to be found. I'll be showing works in progress, some free block patterns and announcements of events I'm involved in. Hope you have fun and let me know what you think! This Gypsy Caravan quilt just makes me smile on a chilly day. The pattern for Gypsy Caravan is available at www.gumbodesignstudios.com. I'm always talking about quilting or trying to keep the deer away from my flower garden.